Well, I know it might look really awful, but it’s not that bad, trust me. First, I included TONS of photos, but that’s just me, you know. I like to include photos of practically every step. It may be a little too much, but I’m really that visual. What can I say? As for the list of ingredients, it’s really not as crazy as it looks. A lot of them get listed twice and even 3 times, because they are needed in more than one step. Plus, most of them are pretty common ingredients, stuff that you probably already have in the cupboards. 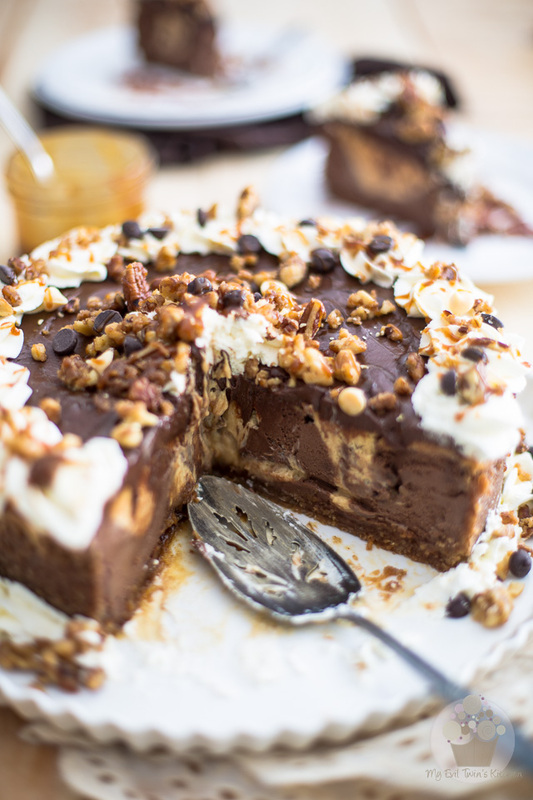 And in the end, it’s so devilishly decadent, you’ll find it’s worth every single second spent in the kitchen… and every single calorie, too! 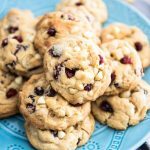 Each and every single bite will bring velvety and crunchy, sweet and salty, tangy and chocolaty perfection to your mouth. 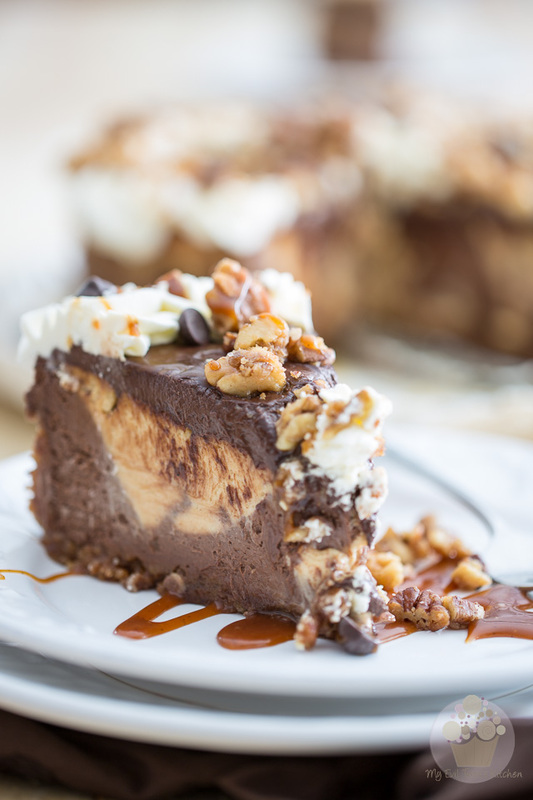 This cheesecake simply has the perfect balance of everything. In fact, once you’ve trie it, you’ll probably find yourself wanting to make it over and over again. At least if YOU don’t, your friends, other members of your family, co-workers and everybody who’s been lucky enough to get a taste of it, will beg you to! 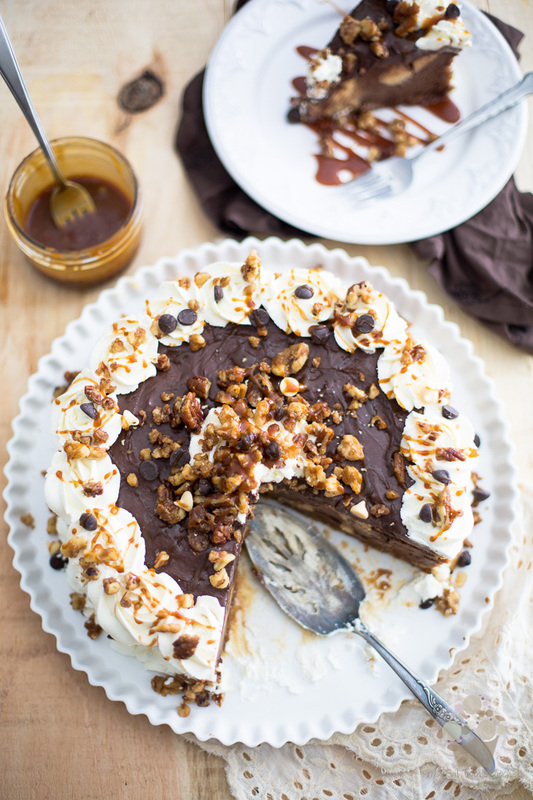 First, you’re gonna need to make some salted caramel so it has plenty of time to cool. Follow the instructions in the other post and then come back to this one just as soon as you’re done. Caramel done? You didn’t eat it all, now, did you? Good! ‘Cuz we’re gonna need all of it for this cake. And I do mean ALL of it, so hands off! Alright, let’s make some praline. 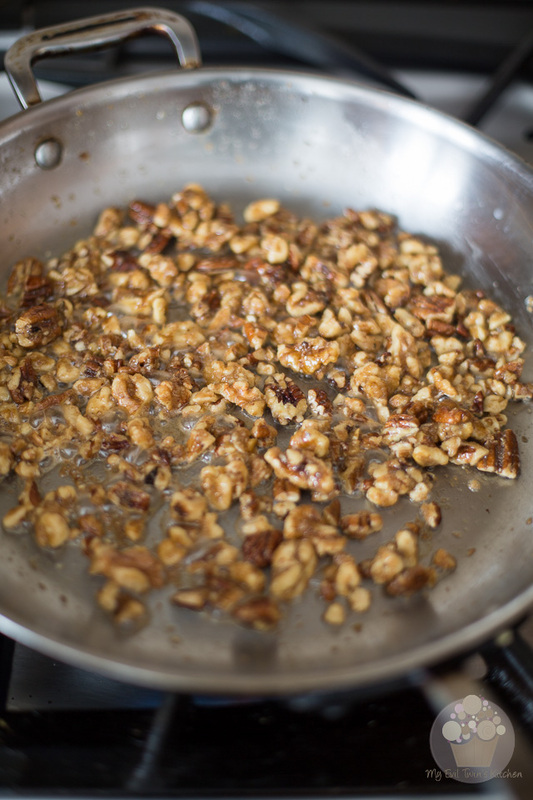 Mix the walnuts, pecans, brown sugar, butter and salt together in a small bowl. The best way to go about it really is to use your hands. It’s a little messy but you get to lick your fingers afterwards, which is pretty yummy. Really, it’s the best way to make sure that the nuts are evenly coated in fat and sugar. You gotta get a little dirty sometimes in the kitchen, you know! Now cook the nuts in a large skillet set over medium-high heat, until the butter starts to bubble. 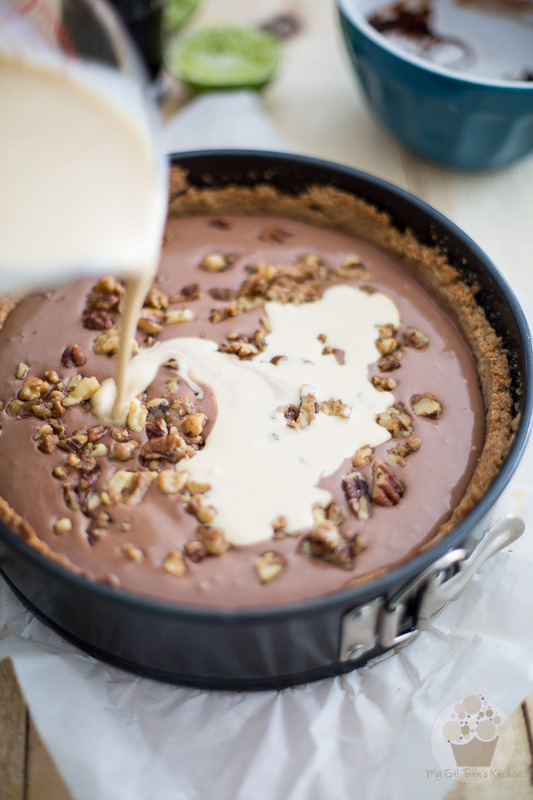 When that happens, you’ll want to continue cooking your praline for one full minute, stirring often. 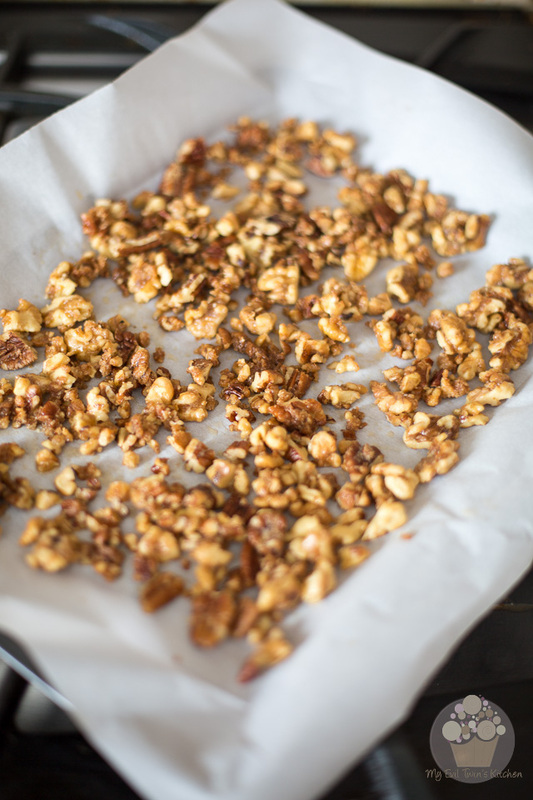 Then transfer the praline onto a sheet of parchment paper and set aside to cool completely. Better put that somewhere that’s way out of reach. Trust me. Perhaps even under lock and key. And no, your neighbor’s house wouldn’t be a good plan. I wouldn’t trust ANYONE around this stuff. 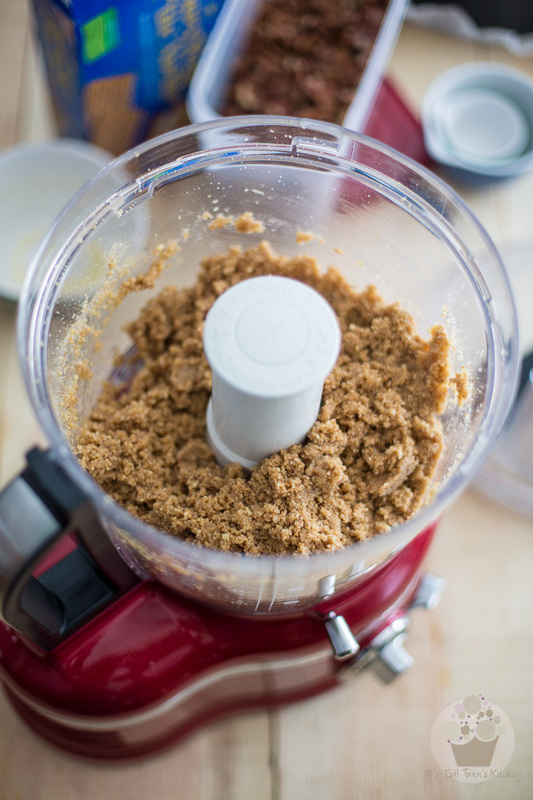 Add graham cracker crumbs, pecans and sugar to the bowl of your food processor, process until it has a texture similar to coarse sand. Add melted butter and resume processing until well combined. Grease the side of the pan with butter or ghee. Press the crust at the bottom and side of the pan, bringing it almost all the way up the side of the pan. A flat bottomed glass is my weapon of choice to get this job done. 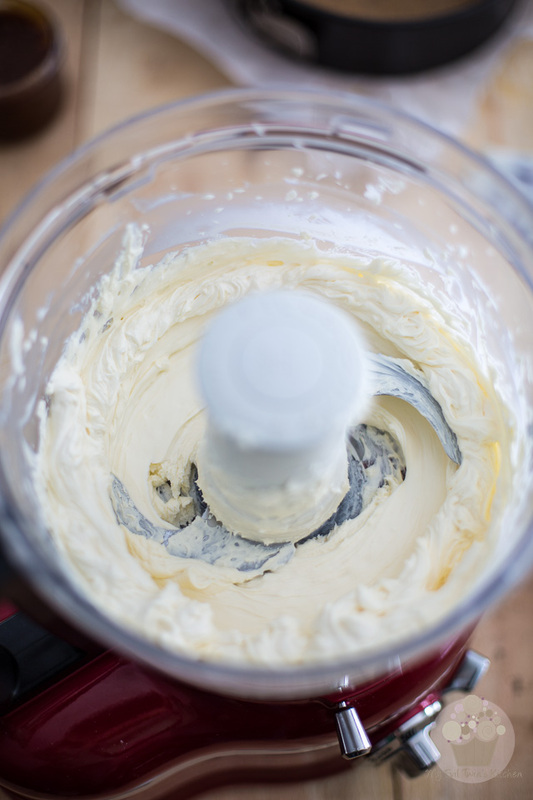 Beat the cream cheese in the food processor until super smooth and creamy. Add the sour cream and resume processing until well combined; stop the motor to scrape the sides once or twice to make sure every last bit gets incorporated. Add sugar, vanilla extract and lime or lemon juice and mix until very well combined. 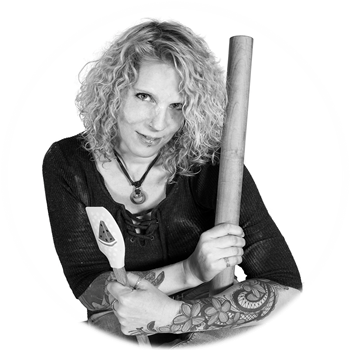 While the motor is running, add the eggs through the feeding tube, one at a time, making sure that each egg gets well incorporated before adding the next, stopping to scrape the sides as necessary. When the mixture is really smooth and the eggs have been fully incorporated, add the starch and salt and mix well. 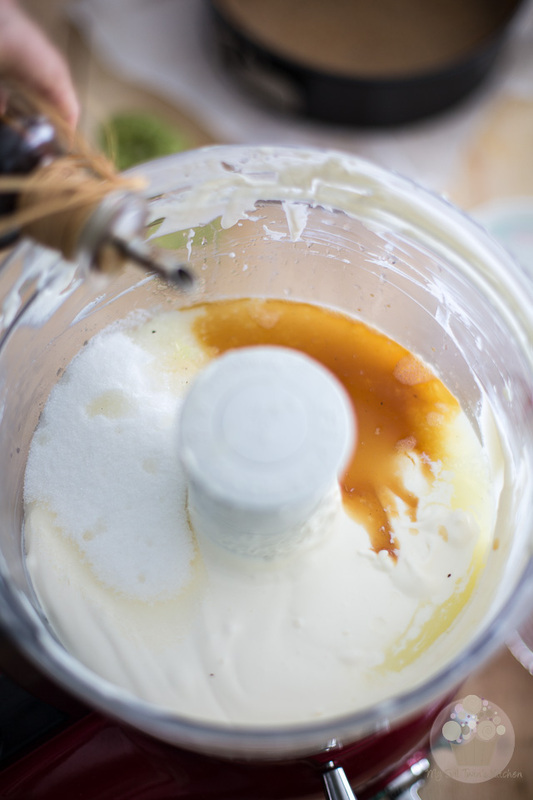 Pour about half of this cheese mixture into a bowl (you’re looking at about 3½ cups) and set aside. 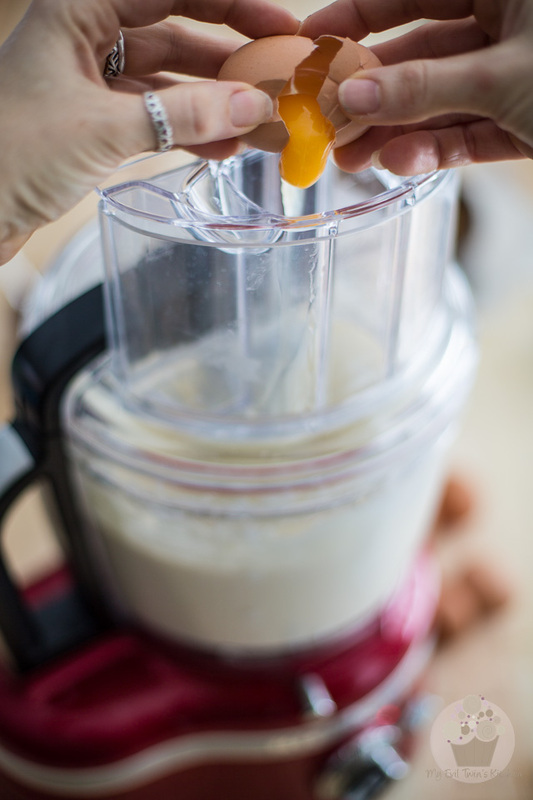 Add 1/2 cup of the salted caramel you made earlier to the cheese mixture that is still in the food processor and mix until well combined. 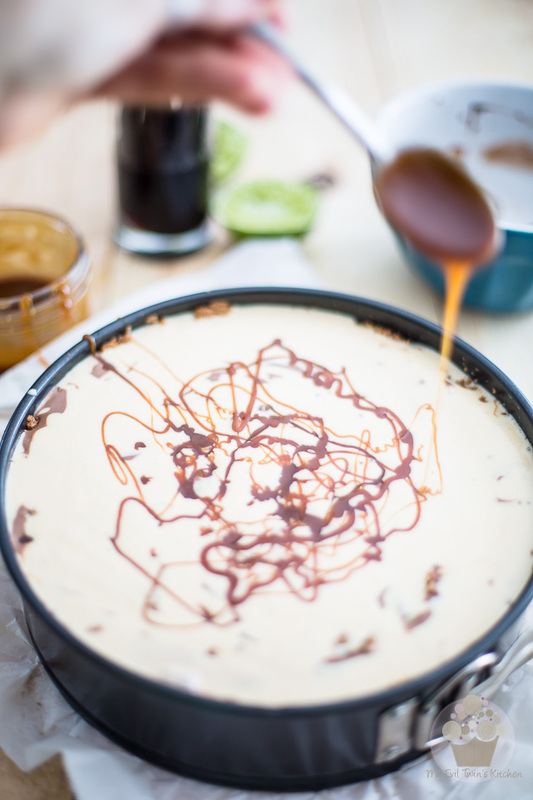 Pour that salted caramel cheese batter into a large glass measuring cup and reserve. Pour the cheese mixture that you reserved earlier back into the food processor. 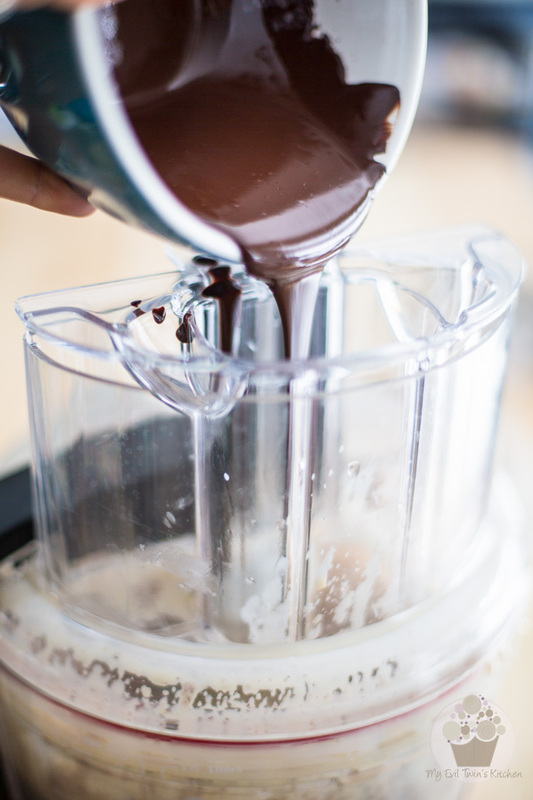 While the motor is running, pour 1 cup of melted cacao paste (or unsweetened chocolate) through the feeding tube and mix until fully incorporated. 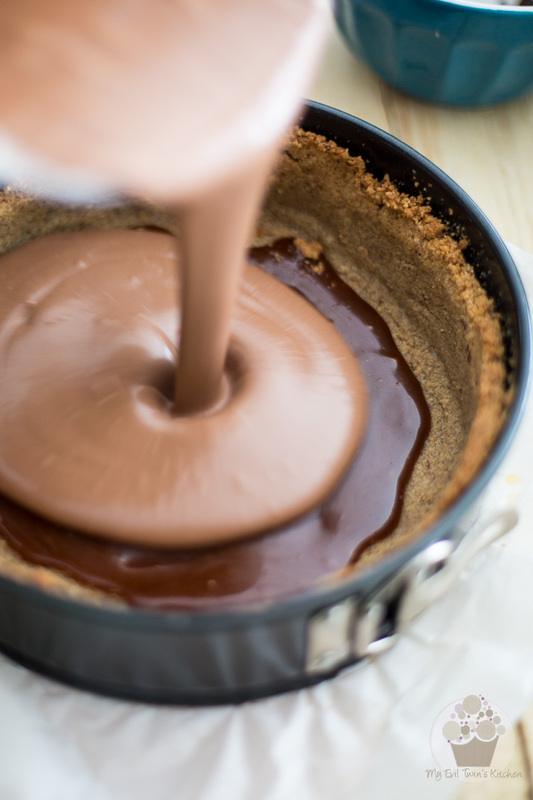 Now pour 1/2 cup of the salted caramel over the crust and spread it delicately with a spatula, not quite all the way to the edge. 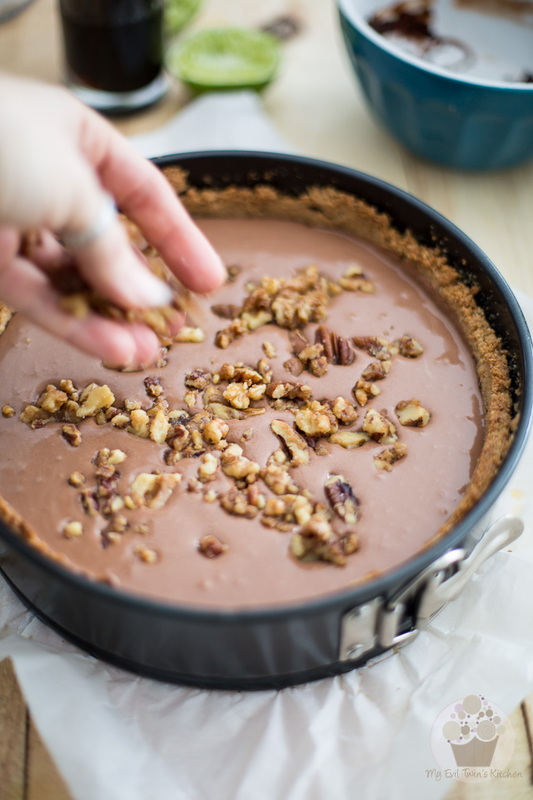 then sprinkle a little more than half of the crunchy praline over the chocolate cheese batter. Put the rest right back into that safe… we’re gonna need it to garnish the cake later! 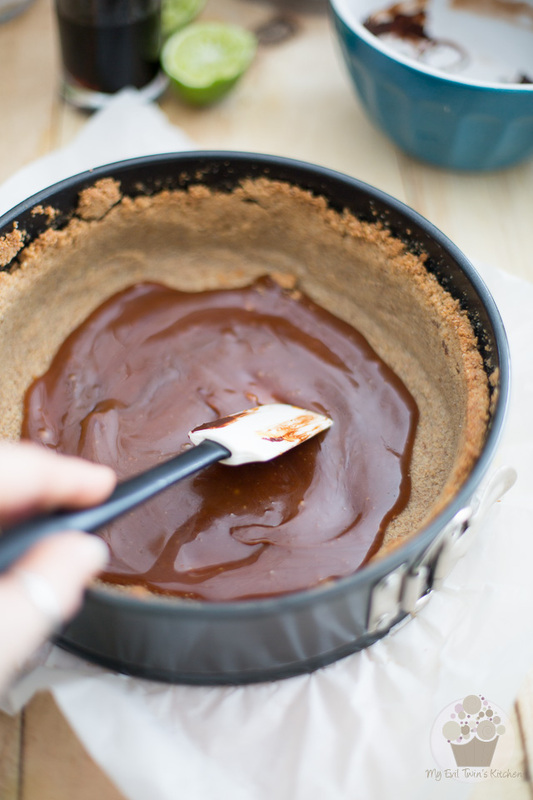 Next, pour the salted caramel cheese batter very delicately over the chocolate batter.You may even want to pour the batter onto a large spoon (as opposed to directly over the batter) to help break its fall. Finally, drizzle about 1/4 cup of the salted caramel over that last layer of cheese batter. Make sure you save a little bit to garnish the finished cake, later. 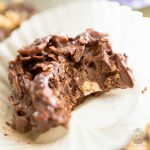 Place the cake over a piece of aluminum foil and fold it over the pan so the exterior is completely covered. Now place your cake in a broiler pan, then delicately pour some boiling water into that broiler so it goes to about 1/4 of the way up the side of the pan. Place that rig onto the middle rack of your oven, decrease temperature to 350°F and bake your cake for 25 minutes. At that point, decrease temperature once again, to 250°F and continue baking your cake for a further 75 minutes. 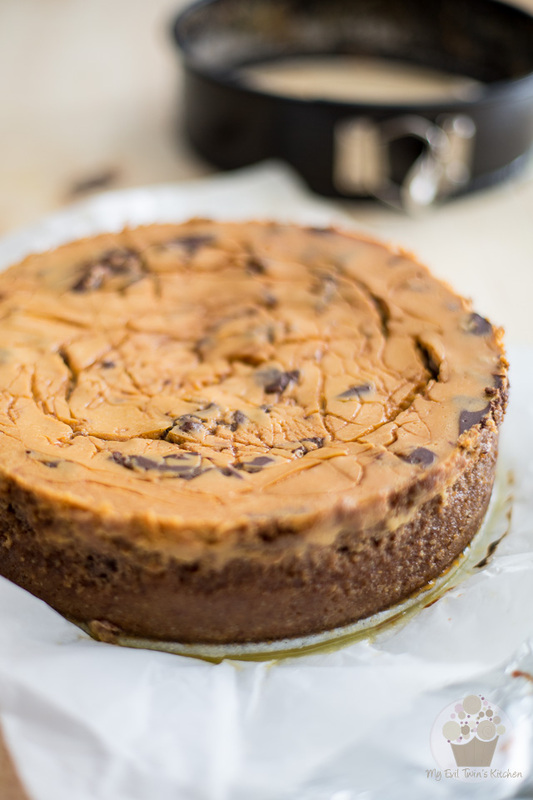 When the cheesecake is completely cooled, run a knife around the rim and refrigerate uncovered for at least 6 hours, preferably overnight. When the cake is completely chilled, delicately remove the ring from the pan. 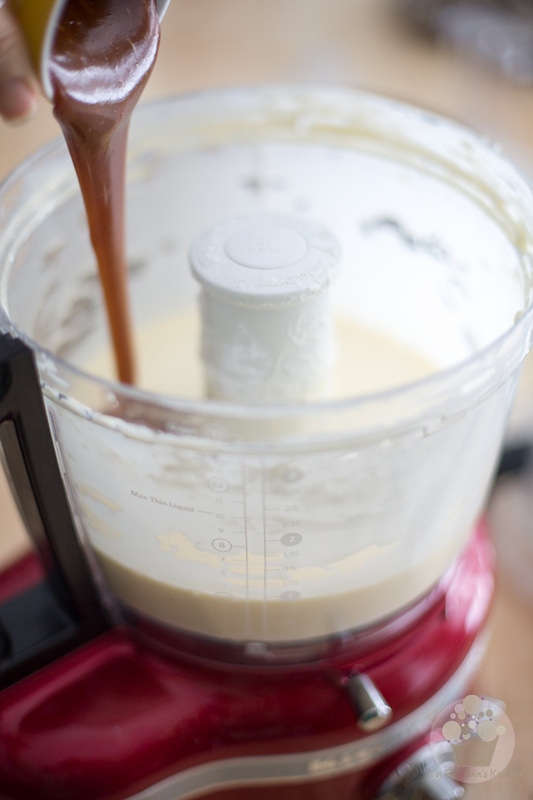 Bring the sour cream (or heavy cream), milk, honey, butter and vanilla extract to a boil over medium heat. 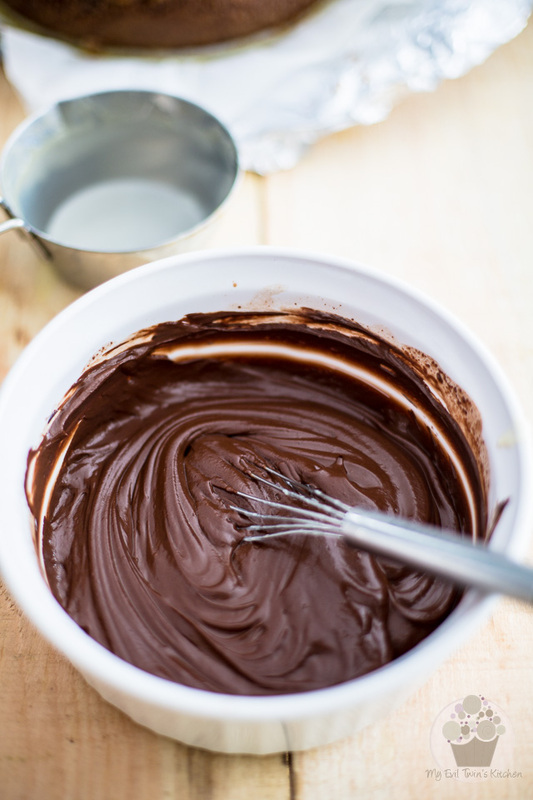 Immediately pour that over the finely chopped chocolate and let it sit undisturbed for 2 to 3 minutes, then stir delicately with a whisk until smooth. If the cream wasn’t hot enough to completely melt the chocolate, finish melting it in the microwave in 30 seconds bursts, mixing well between each burst, until it’s completely melted but not hot. You could also do this over a double boiler. 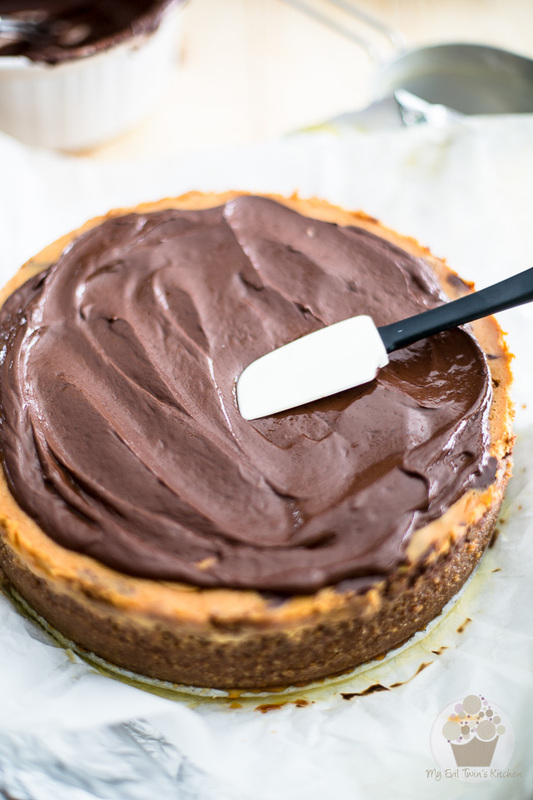 Pour this chocolate glaze over the chilled, unmolded cheesecake and spread it delicately with a spatula, not quite all the way to the edge. 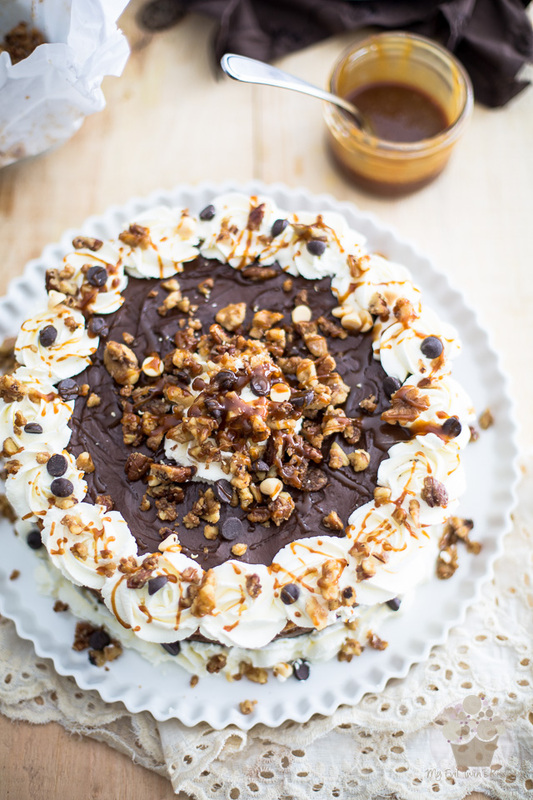 Send for a quick trip to the fridge while you whip the cream! 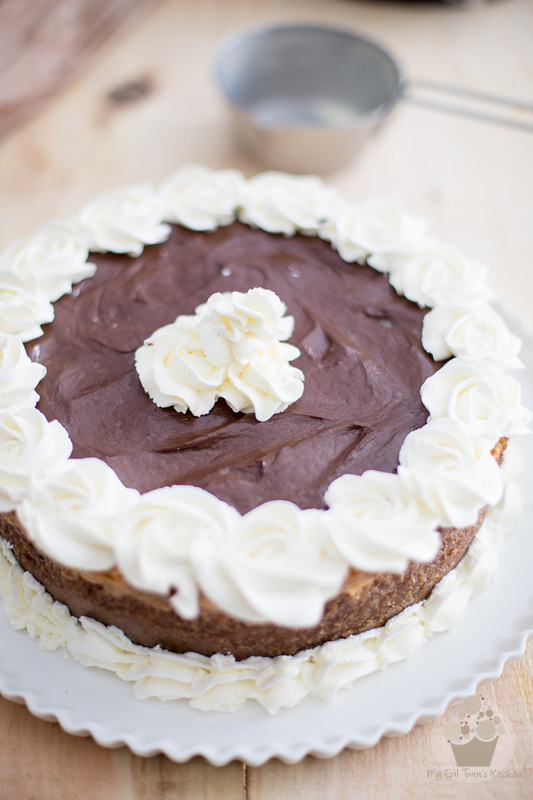 Make the whipped cream and then pipe little swirls of whipped cream all around the top and bottom perimeter, as well as in the center of the cake. Sprinkle what’s left of the crunchy praline (you still have some left, right? Good!) 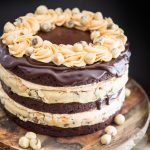 as well as a handful of mini chocolate chips over the whipped cream, then drizzle some salted caramel over the entire cake. If you still have a little bit of that salted caramel left, use it to decorate the plates. Store you cake in the refrigerator in an airtight container, where it will keep for up to a week. Serve chilled, preferably, or at room temperature. 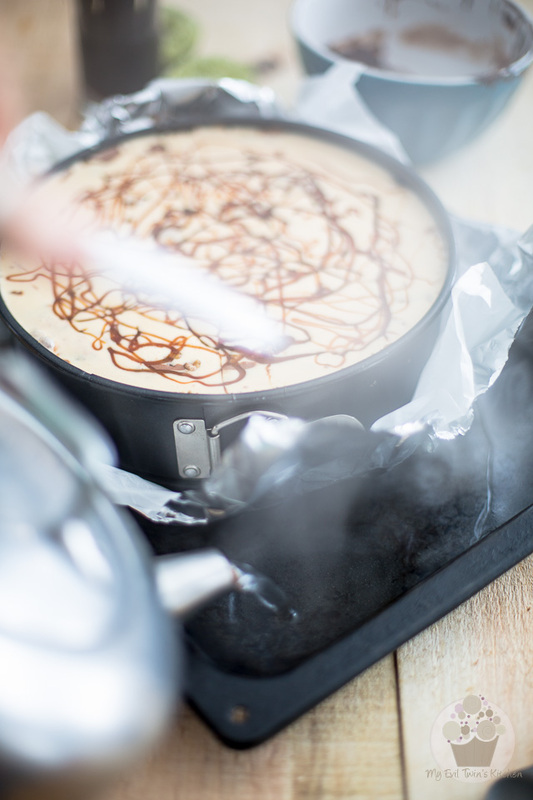 Start by making the salted caramel so it has plenty of time to cool. 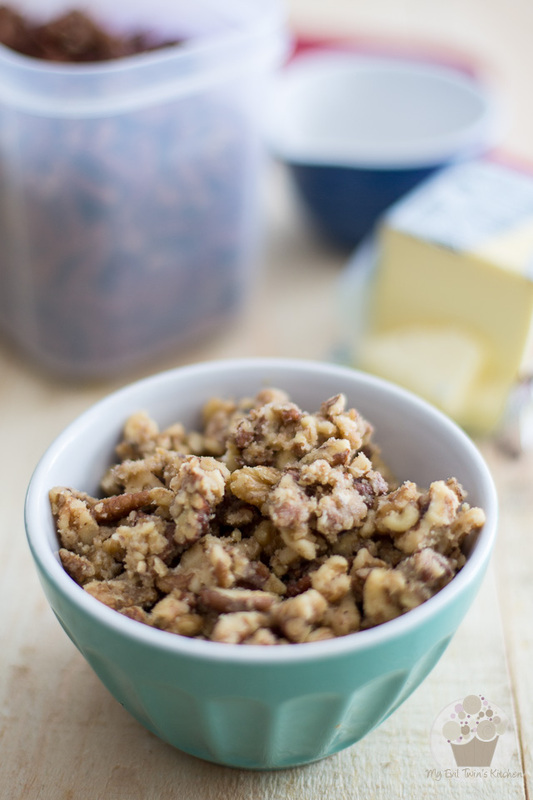 Then, make the praline: mix the walnuts, pecans, brown sugar, butter and salt together in a small bowl. Cook this in a large skillet over medium-high heat, until the butter starts to bubble. Continue cooking for one full minute, stirring often and then transfer onto a sheet of parchment paper and set aside to cool completely. 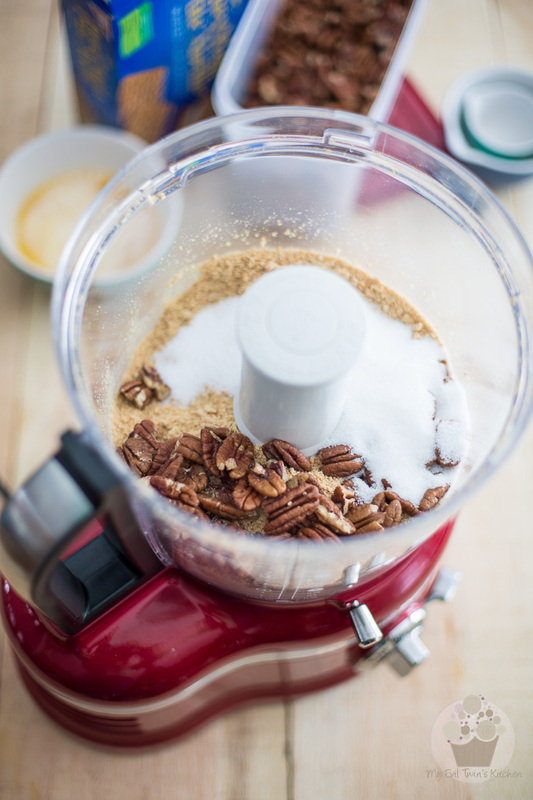 Add graham cracker crumbs, pecans and sugar to the bowl of your food processor, process until it has a texture similar to coarse sand. Add melted butter and resume processing until well combined. Press at the bottom and side of the pan, bringing the crust almost all the way up the side of the pan. Bring about 4 cups of water to a boil. 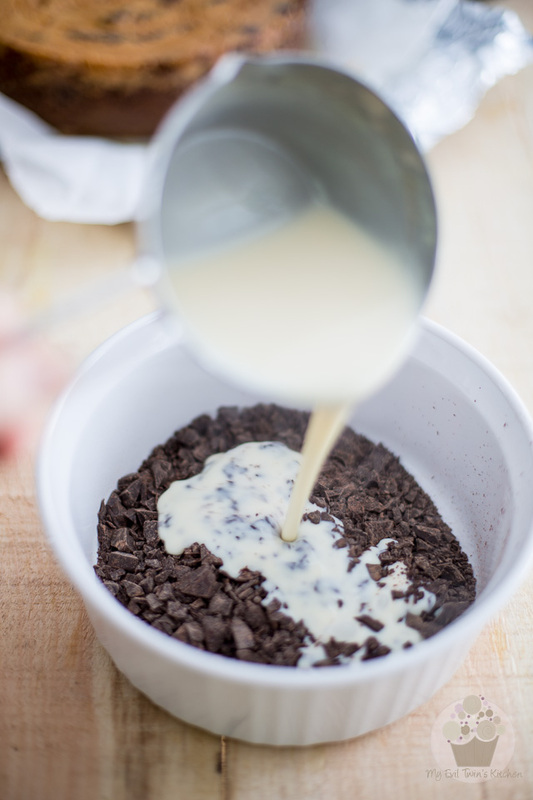 Pour about half of this cheese mixture into a bowl (you're looking at about 3½ cups) and set aside. 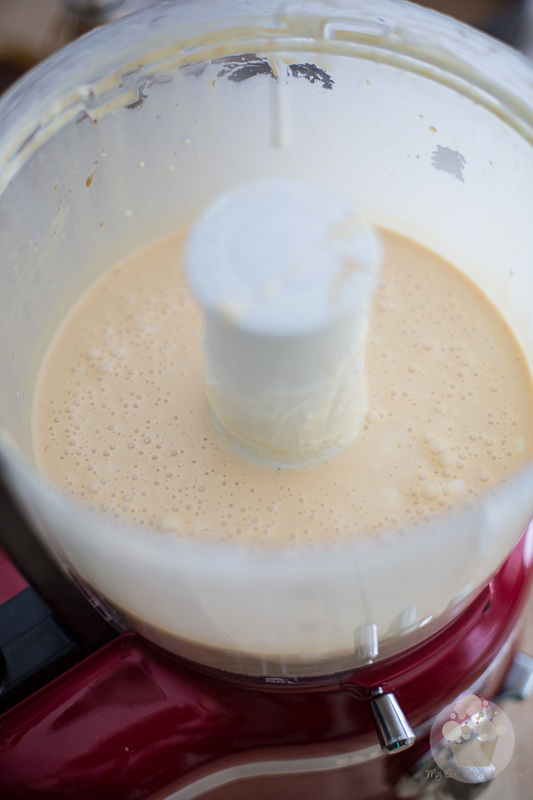 Add 1/2 cup of the salted caramel you made earlier to the cheese mixture that is still in the food processor and mix until well combined. 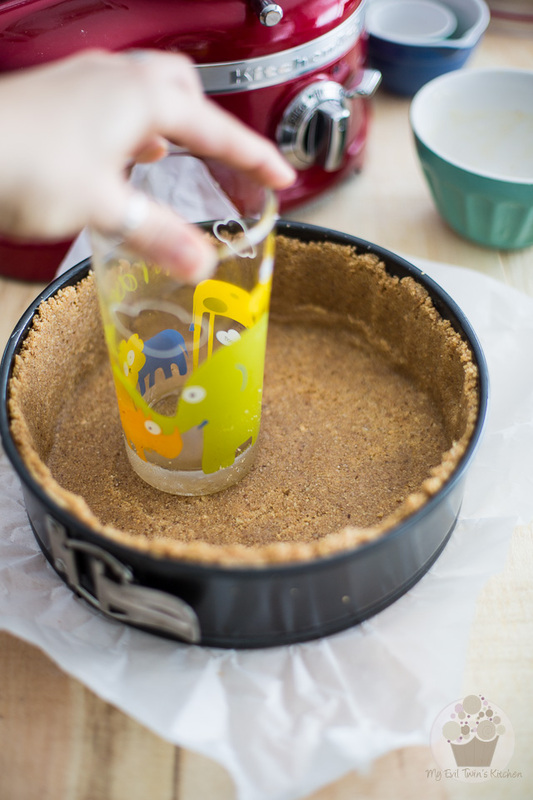 Pour that into a large glass measuring cup and reserve. 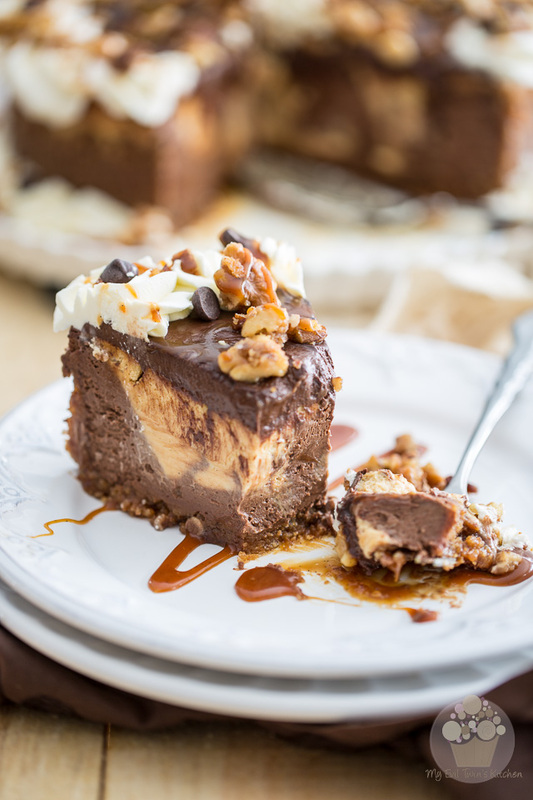 Pour the reserved chocolate cheese mixture over the caramel, then sprinkle a little more than half of the crunchy praline over the chocolate cheese batter. If the cream wasn't hot enough to completely melt the chocolate, finish melting it in the microwave in 30 seconds bursts, mixing well between each burst, until it's completely melted but not hot. You could also do this over a double boiler. Pipe little swirls of whipped cream all around the top and bottom perimeter, as well as in the center of the cake. 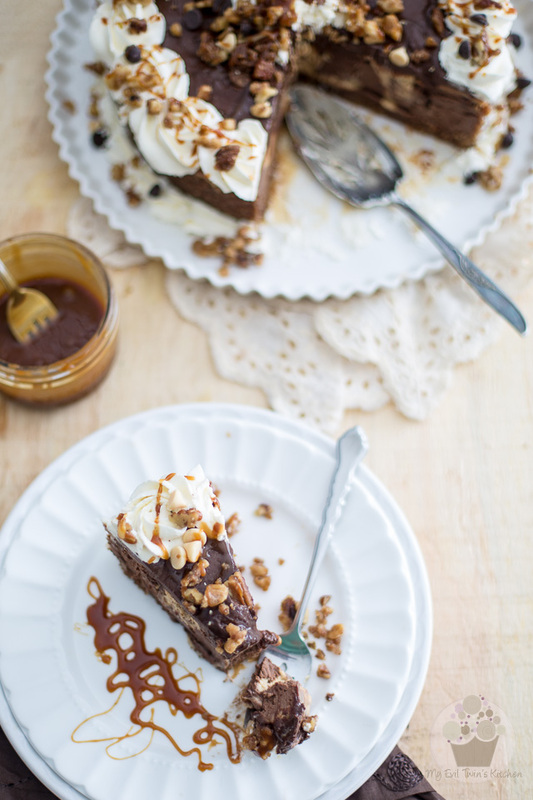 Sprinkle what's left of the crunchy praline as well as a handful of mini chocolate chips over the whipped cream, then drizzle some salted caramel over the entire cake. 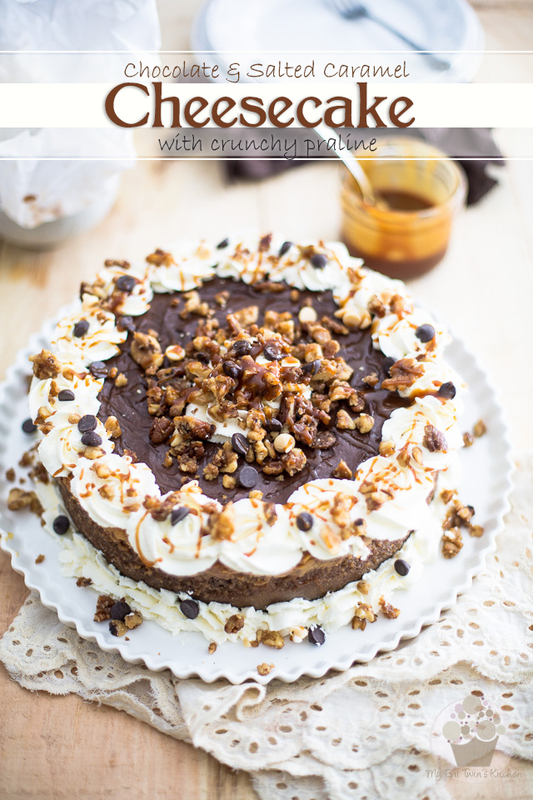 Stored in the refrigerator in an airtight container, this cake will keep for up to a week. amazing. now to recreate this with dairy and gluten free . I will, I can with your help make this! you go girl! 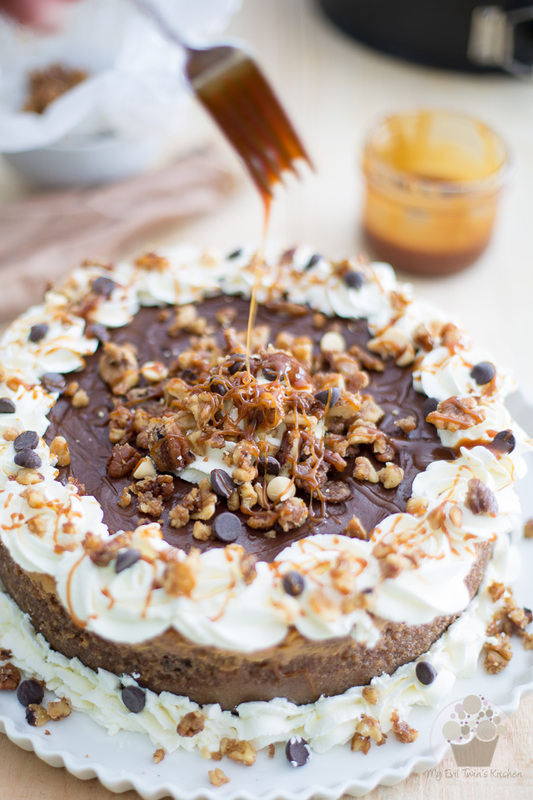 I cant wait to try this for my BF’s birthday .but he is gluten intolerant.what do you suggest that I substitute in for the graham crackers? 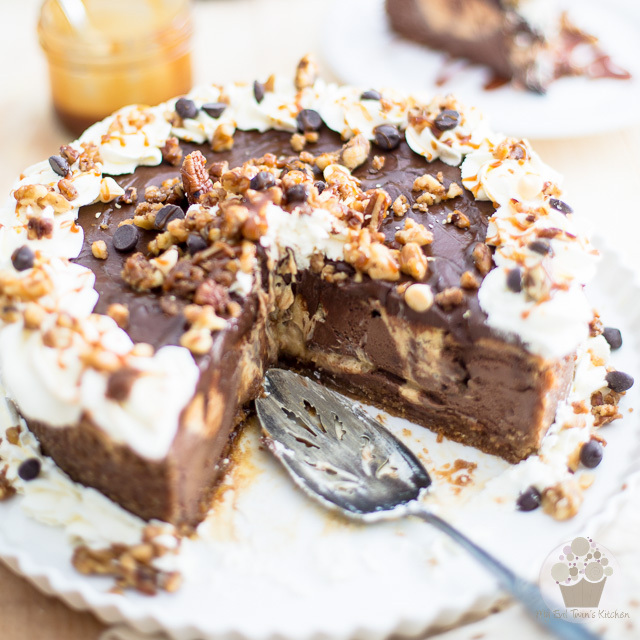 I have made your hazelnut Nutella cheesecake for my friends birthday and it was such a HIT..
its a Great recipe as I am sure this would be as well!! 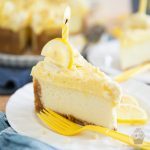 I want to make this for my husbands birthday but my springform pan is only 8″…can you recommend any changes to baking times? I was thinking of either adding a little time (because filling would be thicker) or making 3/4 of the recipe instead of the full and baking it as directed. Any advice? Thanks!